OK. First you need the Blade Tools kit. There is no complicated installation procedure with these. Just copy them to a convienient place on your HD. I have them in a folder 'Blade' in my documents. is a folder 'Textures Compiler'. There are lots of files inside. Don't edit them. For ease of use, create Desktop shortcuts to the file BAB.EXE and also the Texture Compiler folder itself. 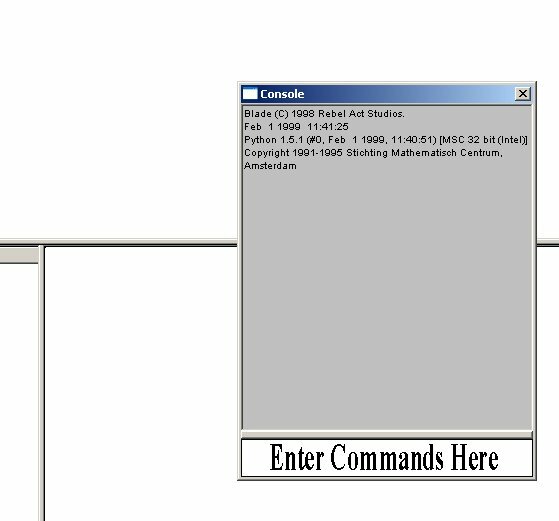 The BAB program converts files in the format .BMP into a file with the format .MMP. The MMP files are what the Blade engine reads. To edit existing Blade skins, you first need to extract the BMPs from the .MMP file. The BAB tool will not do this, but it can be used as a veiwer. Open the BAB by clicking the desktop shortcut. Two windows will appear. You don't need the Console window yet, so close it. The BAB text is in Spanish, but don't let that scare you. Click 'Archivo' (File). Then 'Abrir' (Open). Navigate to the folder where Blade is installed. The MMPs are either in 3DObjs or 3DChars folder. All the character skins are in 3DChars folder. Open the file Kgt.mmp. All the skins for the Knight model are in here. Click KGTNF in the Nombre (Name) column. The image should appear in the lower right field. *Word of warning here. The blade tool software was made 'in house' by RAS and has some some lingering bugs. These are not a problem as long as you know where they are. There is one here. Don't use the wheel on the mouse to scroll down in BAB unless you have a picture showing. If you do, the BAB will crash. There is a sort of system, but it's subject to a few variations, but it's not too difficult to figure it out. Just to make things confusing the rest of the armour skins are not named like this. But ignore them for now. the same as the unwounded version but with _W on the end. You have to have these even if the wounded and unwounded bitmaps are the same. You can't save the bitmaps diectly from BAB. You have to grab them. Most graphics programs have a screen grab facility. I use PaintshopPro. However you do it, the bitmaps need to be exactly 256x256 pixels. Now the hard part.Use your fav graphics prog to alter the bitmaps. It's a good idea to save versions in seperate folders within the Kgt folder. The RAS bitmaps are quite small and it is tricky to work on them. And it can be mind=boggling trying to work out which part belongs there. I won't dwell on this as most people will be better at it than I am. Only work on the unwounded skins. When you have got them to a point where you think they are finished, save copies of the unwounded with _W on the end to replace the original wounded bitmaps and add a few wounds. When you have doodled about with the bitmaps and get to the point where you want to check how they look in the game, you have to recompile the bitmaps into format MMP. Open The BAB again. This time you need the Console. To enter commands in the Console you have to do a sneaky trick to expose the input field. Hover the mouse cursor near the bottom of the Consloe window until it turns to a up-and-dowm arrows symbol. Click and drag upwards and you will peel back the bottom to expose a white area. You can type commands here. The grey field on top is purely for output messages. Masklin made a nice little tool to speed up the job of compiling. Copy this code and paste into a new file. Name it genmmp.py (exactly) and save it to the Texture Compiler folder. (select 'all files' option when saving). The only thing you may need to do is edit the BODHome variable to suit your own PC folder structure. If all is well, the bitmaps will load into the top of the BAB window. Nothing will appear to happen, but a 1 will appear in the grey output field of the Console if it has worked. Look in the Textures Compiler/Kgt folder. There should be a Kgt.mmp file. (There will also be a .DAT file. Ignore it). To get the game to use this modified mmp file, you need to replace the original one in the 3DChars folder. *** It's agood idea to save a backup copy of the original. btw. I should point out that there are various other tools that Blade fans have made to aid skinning. I don't mention them here as the I just wanted to outline the basic principles. Go on. Have a go. [:)] If I can do it I'm sure you can. nice work[:)]. reminds me artwork in credits. The bmps take a bit of figuring out. A lot of it is trial and error. btw. RAS models will not wear NWN meshes. They come out backwards.